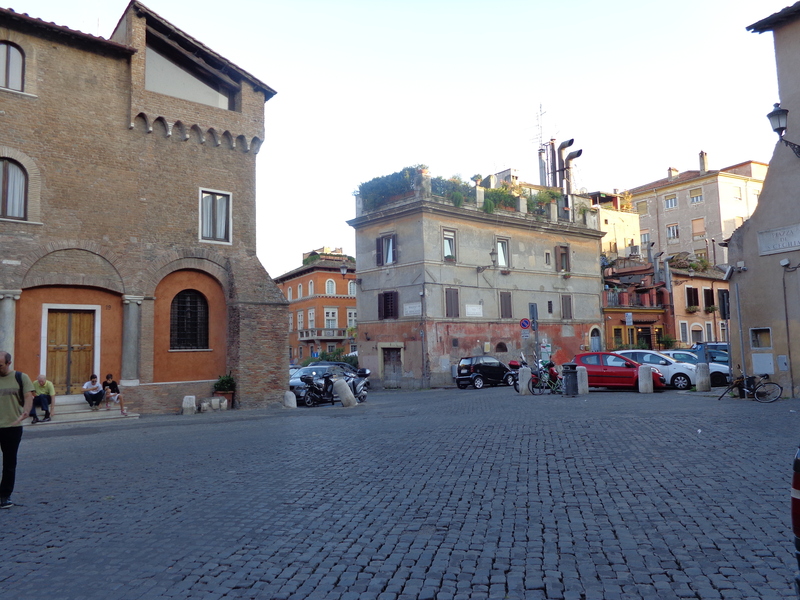 I had just arrived in Trastevere from the ancient forum across the Tiber River in Rome. Dodging traffic and keeping my sense of direction paid off. Trastevere, with a past reputation of that ‘seedy, wrong-side-of-the-river’ village Rome. But I found it anything but seedy. With my back to the river, I began my journey into the depths of this ancient and colorful neighborhood. After stopping by a cafe for a cappuccino and cornetto, I passed ivy-colored trattorias and weathering apartments. Umbrella-shaded outdoor cafes lined the alleyways filled with tatoo shops and alimentari (a small market selling fresh produce, cold cuts and dry goods.) It was in an alimentari that I had my first experience on local manners. “Non toccare, mi metterò che,” “Don’t touch, I will get it.” the young man chided as I picked up a banana. Taking it out of my hands he took it to the front counter. I paid my due and left, a little wiser on local protocol. 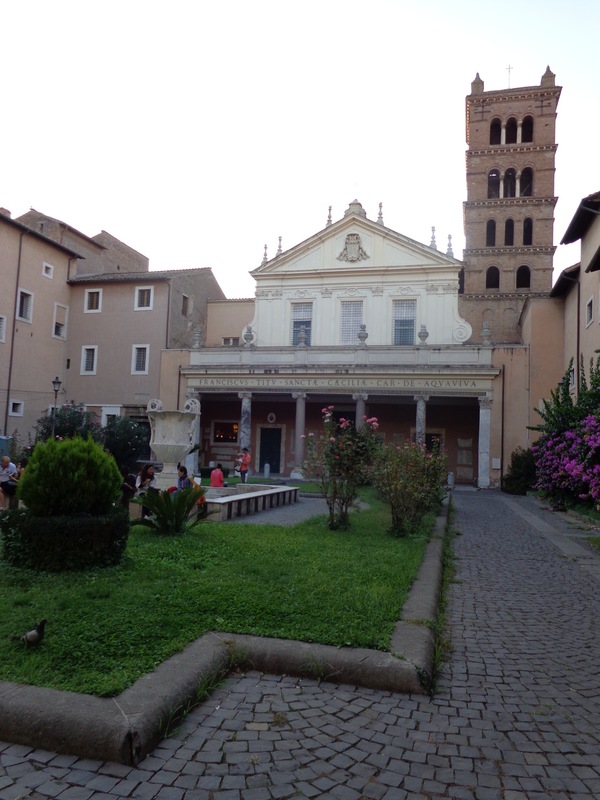 I set off to find the famous old church of Santa Cecilia in Trastevere. Following a few twists and turns, I was standing in the small grassed courtyard before the church. St. Cecilia was a young woman who lived here during the 2nd century when Christianity was sporadically persecuted. As the legend goes, she was martyred by beheading (three attempts) for her faith. A white life-size marble replica of her lies under the altar in the main church. An archaeological dig below the church is believed to be the remains Cecilia’s home. I was eager to go exploring. After entering the church, I found a small office to the left where a friendly Italian speaking nun with a huge smile let me descend the stairs to the house ruins for a small fee. The air grew damp and earthy as I stepped onto the ancient turf. I was experiencing an Indiana Jones moment. It was more spacious than I thought it would be, leading me to believe that Cecilia belonged to a wealthy family. A main hallway ran straight back with rooms on each side. Some original marble pieces, floor tiles and columns were left to be viewed. 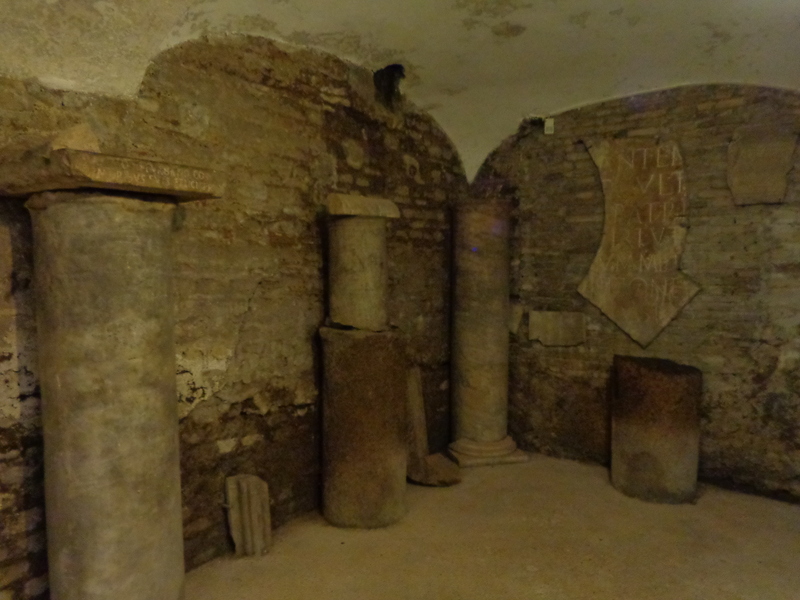 After I left the church of St. Cecilia, I discovered the oldest fountain in Rome. 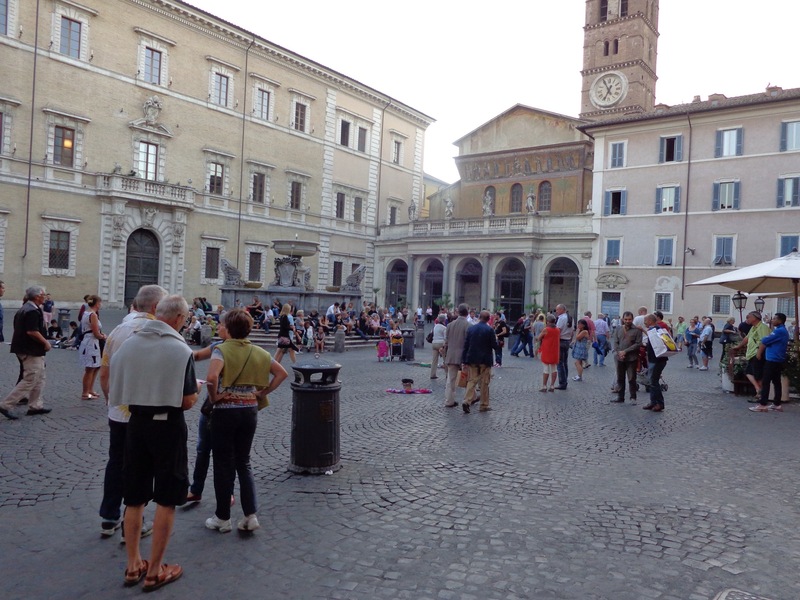 It was located in the center of the nearby piazza of Santa Maria in Trastevere. Traced back to the 8th century, it was restored during the late Renaissance by the architect Donato Bramante. This piazza is the neighborhoods most important one with the steps of the fountain designed to be the so-called ‘sofa’ of the neighborhood. During important soccer games, a huge screen is set up in the piazza for everyone to watch and share in the excitement. This fountain is not without a legend. As it goes, on the night of the birth of Christ a stream of oil burst forth miraculously on this same spot in front of the church. Who can say for sure, but it certainly put this piazza on the map. 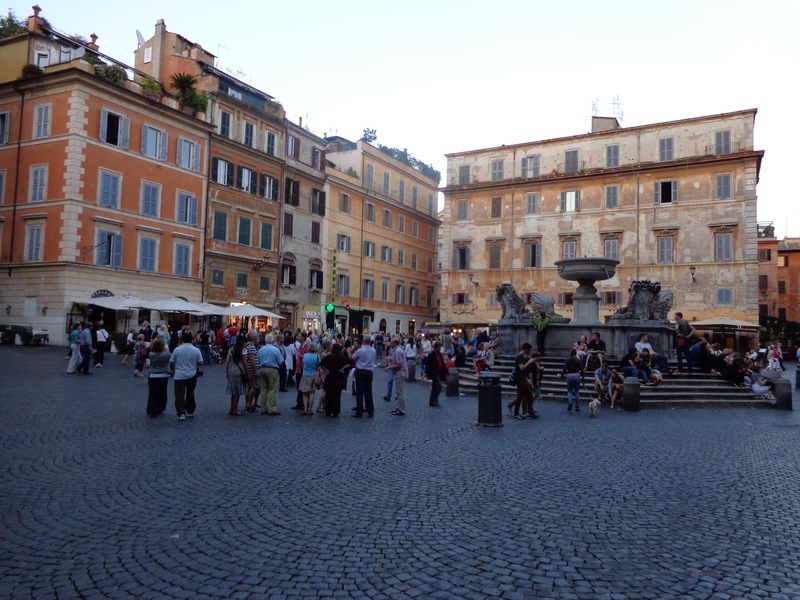 As I sat on the steps of the fountain and watched the hustle of people crossing the piazza against a backdrop of cramped and peeling buildings, I wondered if anything had really changed all that much over the centuries. I crossed the piazza and onto the portico of the landmark church of Santa Maria in Trastevere. The church of Santa Maria was founded in the 4th century, making it one of the oldest churches in Rome. 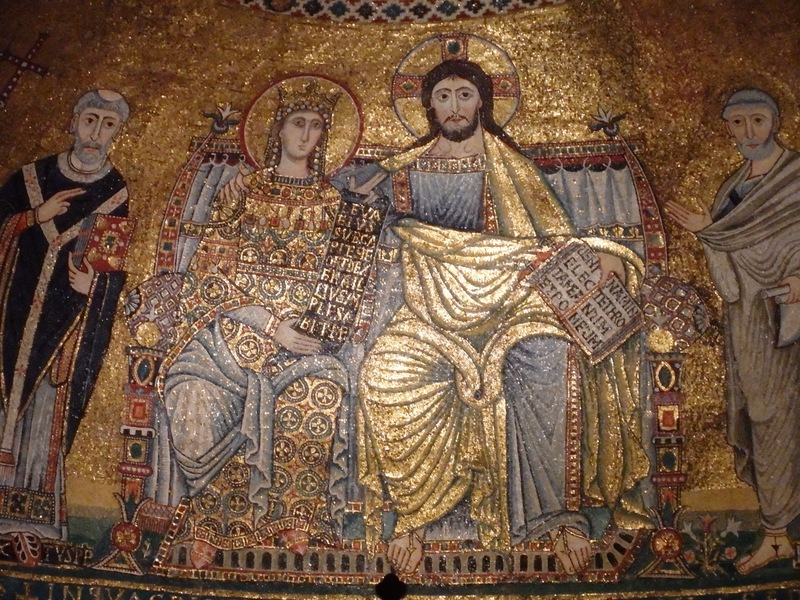 Inside are exquisite Cavallini mosaics dating from the 13th century. The portico (covered area just outside the door) is covered with bits of old stone with Christian symbols. Many are believed to be parts of lids to early catacomb burial niches. The entire front of the columns are lit up at night, casting a golden glow onto the piazza. Evening was quickly descending. The narrow cobbled alleyways lined with medieval houses gave way to a throbbing Roman nightlife as twilight slid into darkness. Pubs, cafes and restaurants faced the crowded streets, beckoning to me as I passed. Waiters stood advertising their menus to the din of a nearby guitar. “Madame abbiamo un tavolo per uno!” “Madam, I have a table for one.” A handsome waiter had just tapped my elbow and motioned toward a seat. His smile and touch convinced me. “Perché sì, grazie,” I buckled. As the evening wore on, I made my way slowly back toward my room. Bands of musicians played along the streets while diners enjoyed good food and friends with indiscreet enthusiasm. Scruffy poets stood in corners quoting in reckless abandon. 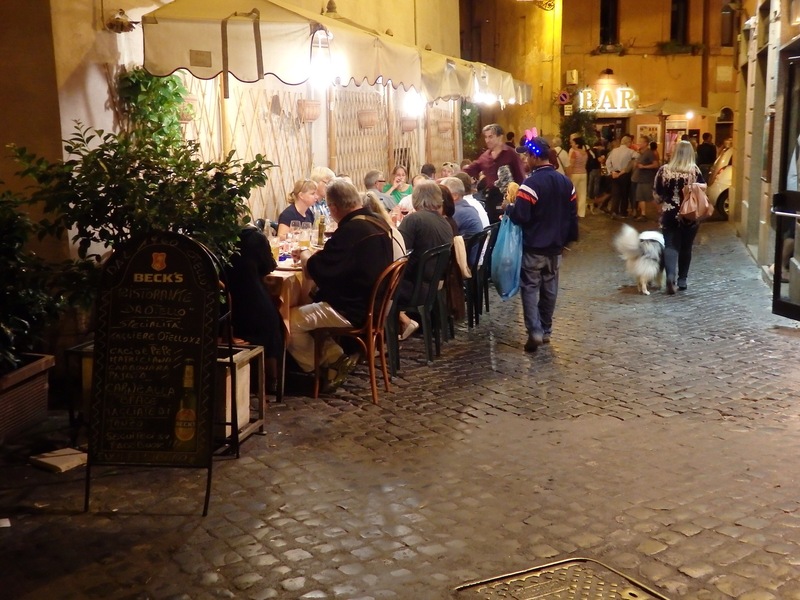 Trastevere hasn’t changed much over the centuries in appearance. The streets still attract crowds of locals and tourists alike. But today, it is becoming an upscale neighborhood, far removed from the pain and poverty of the distant past. My wife and I spent one month last summer in Rome, based in an apartment in Trastavere. 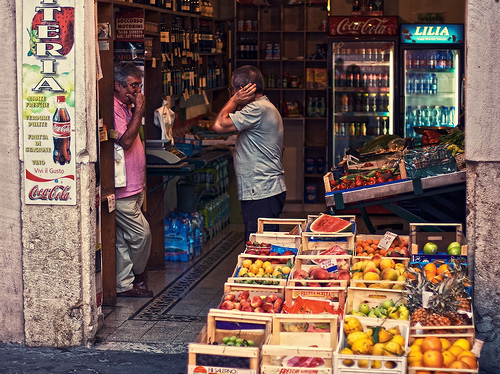 We loved the local life and the markets near our apartment and the ease in getting to Rome on foot or by tram. It never seemed at all seedy and the slower pace and less extravagant sights of Trastavere were welcome after a day with the crowds in Rome. I completely agree. Trastevere had a reputation for a long time of being ‘seedy.’ But it really is not now. I love the nightlife and the ancient ambience of the area. So much history, so much good food!! Your blog is awesome! You have a new follower. I love your photos! Trastevere is a nice place to spend time, as is Italy in general. I am looking forward to your posts. My first site to visit in Trastevere was Santa Cecilia – so beautiful and it was amazing to watch the restoration of the frescoes. I loved every moment there – and felt your pain when you picked up that banana and were scolded. I learned that lesson long ago yet have to remind myself of it with every visit! Thanks for our tour of the Wild Side! Always my pleasure! Santa Cecilia is so ancient and full of mystery (for me). Trastevere is a one of a kind place and, now that i’m getting the hang of their shopping do’s and dont’s, i’m looking forward to returning. Susan, thank you for the intriguing tour. I appreciated the details that you included to make it come alive for us ( such as the poets reciting on the corners). Thank you so much for the feedback, Wendy! My pleasure. Trastevere is magic! I love wondering its streets and visiting the small charming Museo di Roma where they have fantastic photo exhibitions. My favourite Italian movie, Pranzo di Ferragosto, is also about Trastevere. You can still feel the authentic Roman character in that neighborhood if you manage to get off the touristy streets.Thank you for the wonderful post! My pleasure! Thank you for mentioning the museum. Next time I would love to stop on by. 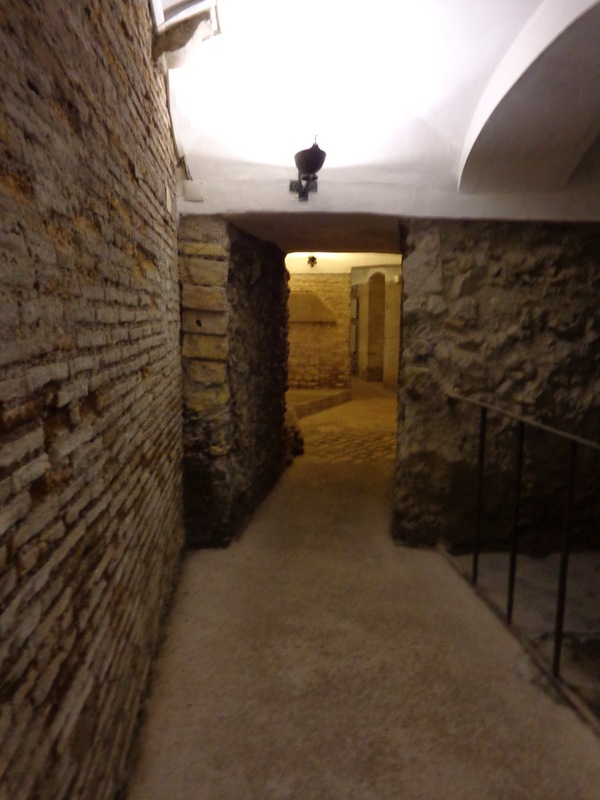 I know what you mean by authentic Roman…I feel it as I walk the alleyways. Layers of ancient history…..overwhelming at times. Glad you liked the article. I am Italian and I can’t get over the “protocol” of not being able to touch the fruit and vegetables I want to buy! 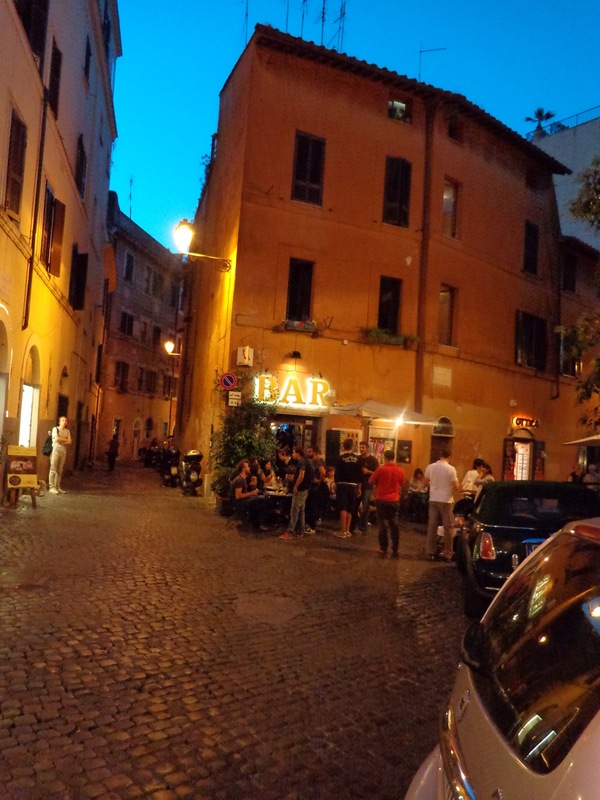 I love Trastevere – beautiful post! 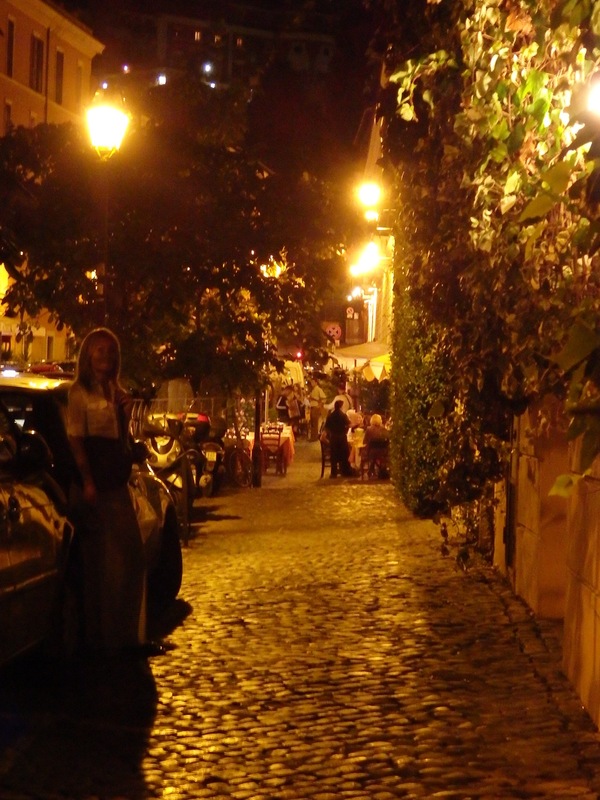 Trastevere is a wonderful area of Rome to wander through. I love the golden church of Santa Maria and St Cecelia’ church is gorgeous too. I came upon it by accident once, but I didn’t know about the underground bit…thanks for the tip. Thank you..I would love to go back and do more exploring. Glad you learned something new. St. Cecilia was an amazing woman. Her underground house is worth a walk through for sure! This made me miss rome so much! Beautifully written and perfect snapshot of trastevere. Hannah, thank you! I was missing Rome as I wrote it:) Good news is, we can always return. Doubt much will change in the meantime! That was a beautiful post, loved learning the history of the little places, like St Cecilia! Wonderful! So glad you enjoyed it and learned something. St. Cecilia was a pretty amazing lady! Thank you, Susan. Until now, Trastevere has just been a stop on the railway line for me! I’m so glad you enjoyed the article and that Trastevere has become more of a presence to you. It is truly a unique experience! Timeless Trastevere! 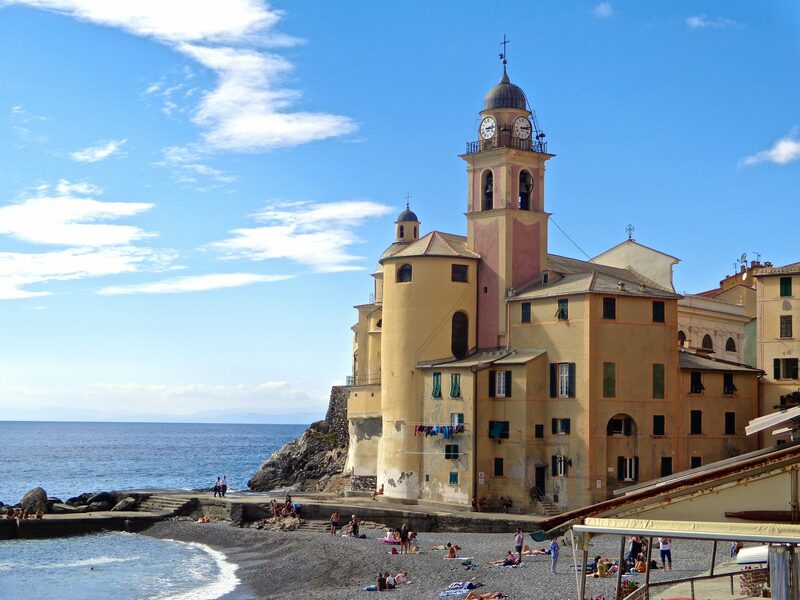 I was there nearly 20 years ago and celebrated Thanksgiving with a friend here with a prayer service at Santa Maria and dinner in one of the little restaurants on the piazza. Your pictures show me it remains much as I remember it. Thanks for taking me back to a warm and happy day in Italy. My pleasure. 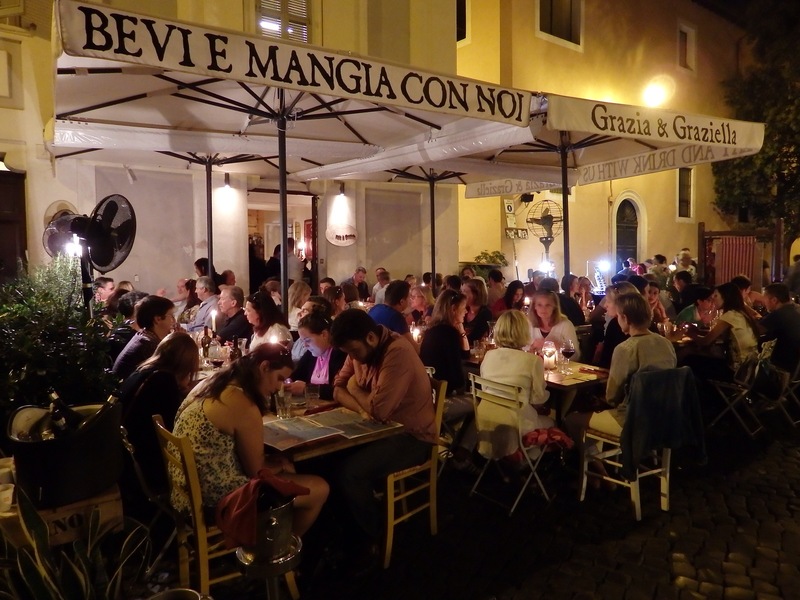 Your adventure in Trastevere sounds like a memorable time. Trastevere seems to stay ‘timeless.’ One of the things I love about it! Lyn,thank you! I too love the back roads. You can probably tell by my writing subjects. I can’t wait to read all about you new discoveries. Enjoyable reading and pictures. Except for the specific restaurant you have written about places I have enjoyed in the past and hope to see again in a couple of years. Thanks for the memories! Thank you Joan. Glad you liked it. It’s fun to revisit places you’ve been to. I do that a lot through other posts I read. Good to hear your feedback.